The Internet's Very Own Hall of Fame, Who Would You Nominate? Nearly three decades after the internet’s official birthday, the Internet Society will be honoring the very first inductees into its Hall of Fame. In total, the group comprises 33 technology luminaries who have all left an indelible fingerprint on the modern technological landscape. Any self-respecting geek will know at least some of these names. (And if not, well, at least they make for good trivia questions at your next get-together.) The distinguished group includes Robert Kahn and Vinton Cerf (the founders of TCP/IP); Jon Postel (editor of RFC document series, administrator of IANA); Tim Berners-Lee and Robert Caillau (founders of the world wide web); Phil Zimmermann (inventor of PGP); and Mitchell Baker (chairperson, Mozilla Foundation/Mozilla Corporation). Yes, they are credited with (to blame?) for that wacky, crazy, wonderful and infuriating place known as the Internet. And wouldn’t you know, former vice president Al Gore also made the cut, as did Linus Torvalds (father of Linux) and Craig Newmark (father of Craigslist). For the complete list, check it out below. What tech luminaries would you nominate for the Hall of Fame? 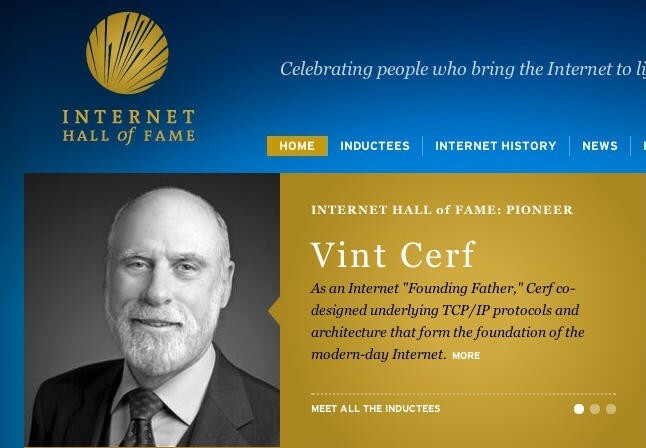 Vinton Cerf: Considered one of the father’s of the internet, Cerf co-wrote the TCP/IP protocol that unites the world’s computer networks into the internet. He also co-founded ISOC, served as chairman of the board of ICANN, and is now a vice president at Google. Danny Cohen: Cohen created the world’s first real-time visual flight simulator and in 1981, ported it over to run over Arpanet, creating the net’s first real-time application. Cohen was also a pioneer, starting work in the 1970s on Voice over IP and online video. Steve Crocker: An early co-conspirator at UCLA with Jon Postel and Vint Cerf, Crocker is known as the father of the Request For Comment (RFC), setting the tone and format for the net’s gracious way of recommending and eventually cementing standards. Donald W. Davies: A Welsh computer scientist who worked with Alan Turing, Davies was one of the inventors of the idea of packet-switched networks in the 1960s, and gave it the name. His invention was used to create the first two packet-switched networks and laid the groundwork for the internet. Elizabeth “Jake” Feinler: For 17 years, she headed the Network Information Systems Center that was the net’s original nerve center for RFCs and internet addresses, composed the net’s original technical documentation. Her group operated the first WHOIS server and developed the top-level domain system comprising .com, .edu, .gov, .mil, .org, and .net. Charles Herzfeld: The director of DARPA from 1965 to 1967, Herzfeld was convinced of the need for interconnected computer and authorized the creation of Arpanet, the net’s direct predecessor. Robert E. Kahn: One of the fathers of the internet, Kahn built on his work at Arpanet to make diverse networks speak to one another in a common language. With Vinton Cerf, Kahn co-wrote the TCP/IP protocol and later co-founded the Internet Society. Peter Kirstein: Working together with Vinton Cerf in the late 1970s, Kirstein co-authored one of the net’s most important papers on interconnection and played a key role in early tests of the internet. Leonard Kleinrock: Starting with his doctoral thesis in 1962, Kleinrock developed key mathematical models for packet switched networks and continued that work as a professor at UCLA. Considered to be among the fathers of the internet, Kleinrock supervised the first message ever sent over Arpanet and contributed key theoretical work for hierarchical network routing. John Klensin: Beginning his work on net standards in 1969, with contributions to FTP, Klensin has contributed to key protocols including DNS and SMTP, as well as serving long terms on the Internet Architecture Board, including chairing the board. Louis Pouzin: The inventor of datagrams (packets without loss notifications), Pouzin designed an early packet switching network that was highly influential in the eventual design of the TCP/IP protocol that defines the internet. Lawrence Roberts: Roberts was one of the developers of the idea of using data packets to create a distributed computing network, and in 1966, became the program manager of Arpanet and was responsible for the system’s design. Mitchell Baker: Starting as the lawyer who wrote the open source license for Mozilla, Baker led Mozilla into developing Firefox, which upended the stagnant web browser market just as the net entered the world of Web 2.0 interactivity. Baker has turned Mozilla into a force for the open web that also delivers free, open-source applications into the hands of millions of net users. Tim Berners-Lee: Marrying hypertext to the TCP/IP protocol, Berners-Lee invented the World Wide Web in 1989 as an open standard. In addition to designing HTTP and HTML, Berners-Lee also invented the first browser and web server. Robert Caillau: The co-founder of the World Wide Web, he co-authored the funding proposal for the project to CERN with Berners-Lee. He also wrote the first web browser for the Mac. Van Jacobson: When the internet began to grow in the late 80s, Jacobsen devised a flow control algorithm for TCP that allowed the network to scale and avoid congestion, which is still used today. A leader in network diagnostics and performance, he won a ACM SIGCOMM lifetime achievement award in 2001. Lawrence H. Landweber: Working on behalf on a consortium of universities, Landweber proposed the creation of a federally funded network, called CSNET, that would link up university computer science programs that couldn’t get on Arpanet. CSNET, funded in 1981, linked up more than 180 universities internationally, spread the gospel of the internet and served as the predecessor to NSFnet that became one of the internet’s backbone networks. Paul Mockapetris: Recognizing in the early ’80s that a single, centralized table linking domain names to IP addresses wasn’t going to scale, Mockapetris proposed distributed system instead, inventing, along with Postel, the net’s distributed and dynamic Domain Name System. Craig Newmark: Seeking to connect a group of friends, Newmark founded Craigslist in 1995, making it possible for net users around the globe to find apartments, jobs and used couches for free. Newmark has also been vocal in supporting an open web. Ray Tomlinson: In 1971, Tomlinson created the first email system that could send messages between different systems on Arpanet, and is the person responsible for using the @ sign to differentiate between hosts. Linus Torvalds: In 1991, in conjunction with his Masters thesis, Torvalds began work on the free and open-source Linux kernel, leading to a wide range of Linux operating systems that power many of the world’s servers, routers, supercomputers and smartphones. Phil Zimmermann: Zimmermann, a tireless advocate for privacy and security, is best known as the creator of Pretty Good Privacy, the net’s leading e-mail encryption system, which earned him an investigation by the U.S. government. Randy Bush: Bush founded the Network Startup Resource Center (NSRC), which with the help of the National Science Foundation, helped spread networking technology to the developing world in order to help local scientists, engineers and educators collaborate with international colleagues by providing assistance to local network engineers. Kilnam Chon: Chon won the prestigious Jon Postel Service Award in 2011 for his work in spreading the internet in Asia. Al Gore: As a U.S. senator in the 1980s, Gore was the first politician to grasp the potential of the internet. Gore wrote the High Performance Computing and Communications Act that passed in 1991 which helped spread the net beyond computer science professionals by providing key funding to internet projects, including the groundbreaking Mosaic browser which led to the dot-com boom. Nancy Hafkin: Working for the United Nations Economic Commission for Africa, Hafkin was instrumental in the spread of networking and electronic communication in Africa. In the early 1990s, she played a key role in efforts to spread e-mail to countries in Africa. Geoff Huston: From 1995 to 2005, Geoff helped construct and develop Telestra’s internet architecture in Australia building on his work in the 1980s, when he led the initial construction of the Australia’s internet. He was also the executive director of the internet architecture board from 2001 to 2005. Brewster Kahle: After a successful entrepreneurial career in the first dot-com gold rush, Kahle set out to become the web’s archivist and librarian, creating the Internet Archive that caches copies of the Web for posterity. His newest project aims to collect one copy of every paper book ever printed. Daniel Karrenberg: Karrneberg was the founding CEO of the RIPE Network Coordination Center, which was the world’s first Regional Internet Registry, covering Europe, the Middle East and parts of Africa and Central Asia. Now RIPE NCC’s chief scientist, he has also served three years as the chairman of the board of ISOC. Tan Tin Wee: Dr. Tan Tin Wee founded the multilingual internet domain name system and has an Internet pioneer in Singapore, central to the net’s adoption among both Chinese and Tamil communities throughout Asia. Correction: Phil Zimmermann’s name corrected in list and second paragraph.